Q. How difficult are your products to install? A. Our entire line of products come with clear, simple instructions. All mounting hardware is included as well as mounting templates for all wall mounted mailboxes and address plaques. Q. How long will a mailbox or address plaque last? A. 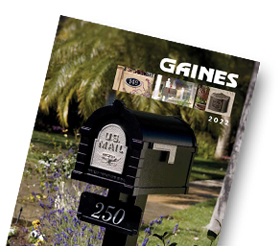 All Gaines products are made from aircraft-grade aluminum, and have a rich, weather-resistant powder-coated paint finish. They will age gracefully over time and provide many years of enjoyment service. Q. How will the solid brass accents and numbers hold up? A. As with any brass elements, you can expect some tarnishing and aging over time. Most people appreciate the natural beauty of this process. The degree of the aging process is affected by a multiple of both environmental and artificial elements. Q. Can I buy direct from Gaines Manufacturing? A. New products, and new products with slight blemishes, can be purchased from us at GainesDirect.com. If you need the location of the dealer nearest you, simply go to the Where To Buy page and well email you back promptly with a dealer name. Q. My mailbox and post were recently damaged. Are replacement parts available? A. Yes. Replacement parts are available for nearly all Gaines products. You can obtain authentic Gaines replacement parts through our online parts outlet, GainesDirect.com. Q. Can the optional Keystone Newspaper Holder be mounted to a Keystone Standard Post? A. Our Keystone Newspaper Holder is only designed to be mountable on the Keystone Deluxe Post and is not currently fabricated to universally fit the Standard post. A. Everything we make we have on this website. Use the Product Locator to quickly browse our family of products.